Coinciding with the Easter holidays, the AIMS Foundation has organized its first initiative in Solsona beyond the summer academy. With the collaboration of the City Council, the Municipal School of Music has hosted an intensive cello course for nine students from Barcelona’s Liceu Music School. 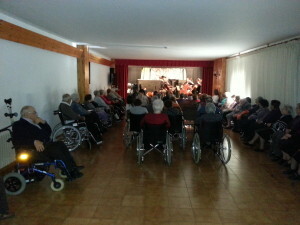 To benefit the community, the students, including Gerard Flotats from Solsona, have performed three social concerts in the association for the mentally ill and substance abuse Sol del Solsonès, in the senior residence Pere Mártir Colomés Hospital, and in the handicapped association Amisol. This has been one of the first collaborations of the AIMS Foundation with the City Hall of Solsona in order to expand the musical activity beyond the summer academy.